I love oats. Eating them takes me back instantly to my childhood. Sitting around my cousins table, surrounded by people I have so many fantastic memories with. We would eat it with fresh cream that came from the cows milked earlier that morning. Truly a flavour of my childhood, simple yet transformative. It is amazing how one taste can transport you back to a moment in time as if were yesterday! And a flavour memory I refer back to often. Looking to do some baking this morning I had oats on my mind. I have an amazing maple bread recipe that I love and have to share soon, but with a bunch of fresh berries in the fridge I thought muffins would be perfect. In a medium sized bowl combine the oats and milk. In a large mixing bowl combine the eggs, canola oil and sugar. Add the oat and milk mixture. Add the flour, baking soda, cinnamon, salt and nutmeg. Spoon the batter into paper lined muffin cups. Bake at 375 for 30 minutes to until a tooth pick inserted in the center comes out clean. 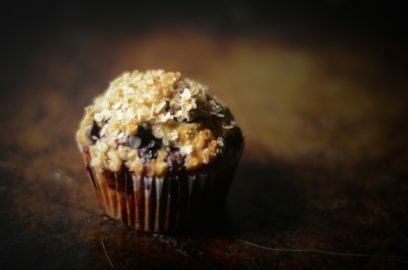 It is a great muffin with fantastic texture from the oats. They are not sweet and have an amazing amount of tart juicy raspberries. With the perfect hint of nutmeg that rounds out the flavour. Yes if the oatmeal is not soaked it would make for a very tough, dry, chewy muffin. It definitely is a muffin with texture! And I agree, this falls into the muffin category, cupcakes are for dessert, this fits into the scope of breakfast! Interesting that you soak the oats in the milk. I guess it hydrates/softens them so that the texture of the muffin is improved? Neat! Hey Mel! Great seeing you! These are a bit more dense because of the oats but the berries add the perfect amount of moisture to counter that! And I agree, the crunchy topping is the perfect finish! Like you’re indulging in something a little naughty when really it is fairly healthy! Can’t ever go wrong with that. The berries definitely put this muffin over the top! The add the perfect amount of sweetness and keep them super moist! Have a fantastic weekend! And thanks for stopping by. Yum! 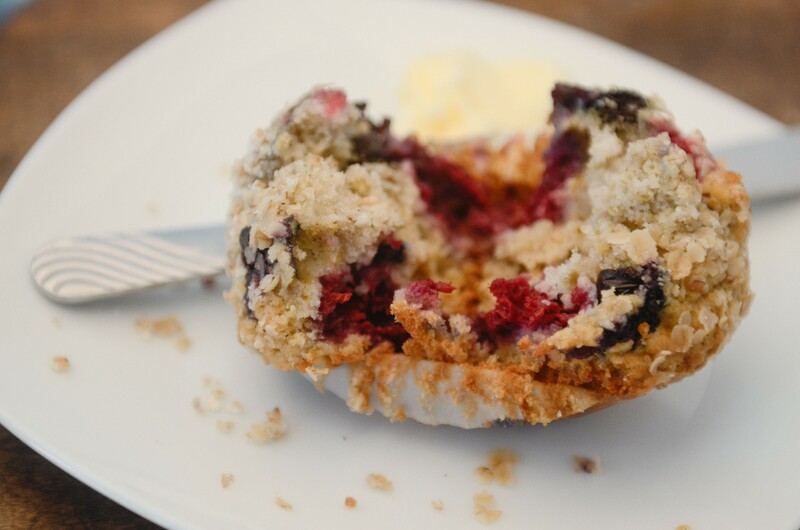 I really love muffins with their fluffy texture and crunchy tops 🙂 these muffins look amazing with all those berries in there! The perfect snack or breakfast. I love oats too, but I definitely had to grow to like them (at least I’m making up for lost time now, hah!) These muffins look amazing and they remind me of the ones behind the counter at bakeries and coffee shops. I’m always partial to the ones with bright, fresh berries poking out of them.